“This an auction for a Crumar Orchestrator. Keyboard is in overall good condition and it sounds good. 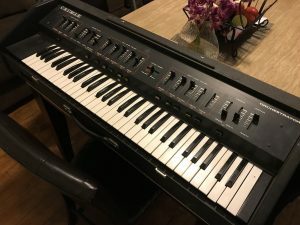 “Up for auction is this VINTAGE CRUMAR ORCHESTRATOR SYNTHESIZER, Good working and cosmetic condition, some tolex tears, but nothing major , cover latches do not lock, I think there is a missing part on both, everything is original and working as it should, 3 missing knobs, and one of the slide pole pot (right hand volume brass control) is broken but still working.” Auction ended. Click here to browse on eBay. “Crumar Orchestrator Synthesizer. Includes 2 pedals and full keyboard cover (not pictured, it’s a hard hinging cover that completely closes the syth up). I have had this unit for about 15 years and it’s time to make some space for new gear!! Want a fat smooth retro sound? Need something to go on the road with you that sets you apart from the rest?? Don’t go to Best Buy and grab the first keyboard you see…..look at this little gem. It plays like it should, yes, but personally I think it’s GREAT for running throught some modern or vintage effects and using it for pure NOISE!!!!!! Swirls and thick moods, effects and backgrounds to your work. Up to you. I have the brochures that originally came with it, as well as a little felt CRUMAR flag (?) that was given away when purchased new. I will have to look around a bit to find them, I haven’t put my hands on these for about 10 years but i’m pretty sure they are still in a file somewhere.” Auction ended. Click here to browse on eBay. 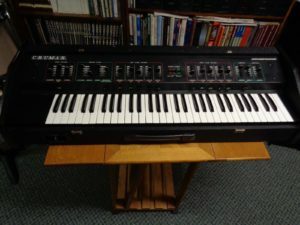 “UP FOR BID IS A VINTAGE 80’s CRUMAR ORCHESTRATOR KEYBOARD SYNTHESIZER “FOR PARTS” UNIT POWERS UP AND PLAYS, BUT IT” Auction ended. Click here to browse on eBay.